When the real world looks like Zwift. Crossover cycling? 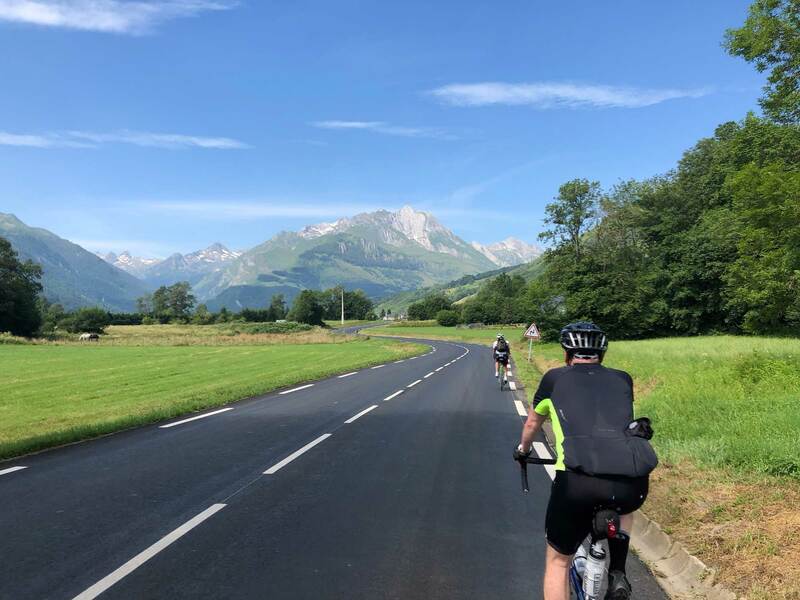 The approach to the Soulor, on our way last Friday to the Aubisque during the Tour de France. One look at this photo and you can, or you should be able to, see why I spend so much time in France. What I’d be missing out on if I didn’t go nearly every single year, during July, for 10 days. This photo actually looks fake, like a Zwift screenshot, but it’s very real. Yes, I want to believe that West Old LaHonda is one of the world’s most-beautiful cycling roads, and it is up there, but much of its status is “relative.” As in, it’s a real standout when you consider the normal roads we ride. Is every road in France like this? No, certainly not. But the traffic is far less than what we see here, the surrounding much less developed, the driving more civil to cyclists (they even have a 1.5 meter passing rule, which is about 5 feet!!! ), and the food… oh my, where do I begin? An assortment of pastries with almost & chocolate & multiple-layers of butter-laden flaky crust, taken with either a double espresso or Orangina or preferably both. That’s breakfast. For lunch, it’s a baguette, typically ham & cheese & butter, sometimes just ham & butter, and why they are so good when they’re so simple remains strange. You might have your choice of 4 or 5 different types of sandwiches (the others being chicken or “vegetarian” which would be egg, lettuce & tomato). And that’s it, no Togos, no Subway made-to-order sandwich. No choice of 24 toppings or 8 dressings or 7 different types of bread. And of course a coke or orangina. Why is it so good? In the countryside, if you’re lucky, you find a roadside stand selling a Saucisse baguette. With the right hot mustard, they are to die for. These are obviously hot off the grill, so not something you’d find in a patisserie (what we might consider a bakery/delicatessen). Any time you see a stand selling Saucisse, it is required that you stop and have one. It will be a local product, with its own special taste, but always good. Think I’m going to be putting up a post just about French food and nothing else!